Home » Posts tagged "value chain"
The value chain can no longer be simply linear. It has to integrate information gathering, retroactions and transformation decisions. Innovation, enterprise agility and the capacity of an enterprise to quickly adjust itself to a changing environment come at this cost. The value chain becomes “looped”, integrating feedback at all levels of the enterprise and encouraging collaboration. Furthermore, it becomes more complex by mobilizing partners. These two characteristics, looping and complexity, call for a new approach to the enterprise and another model. The value chain, such as the one drawn by Michael Porter, is often seen as linear: the enterprise gets its supplies, manufactures, sells and provides after-sales services. Yet, at each point of this “chain”, precious information appears. Who better than the sales representative to get a feeling for what prospects expect? How can the designer come up with the idea that is guaranteed to appeal to the public? Are the marketing or communication departments told when there is a serious malfunction or persistent problem? the relations between these actions, including the required retroactions. This schema serves as a guide to revise the enterprise processes. Such an action concerns what Praxeme calls the pragmatic aspect of the Enterprise System. The recommended approach starts from the semantic aspect, that is to say the “business” objects which express the business fundamentals. It is by studying their lifecycle that we can best anticipate any disruptions and prepare the enterprise to react to them. 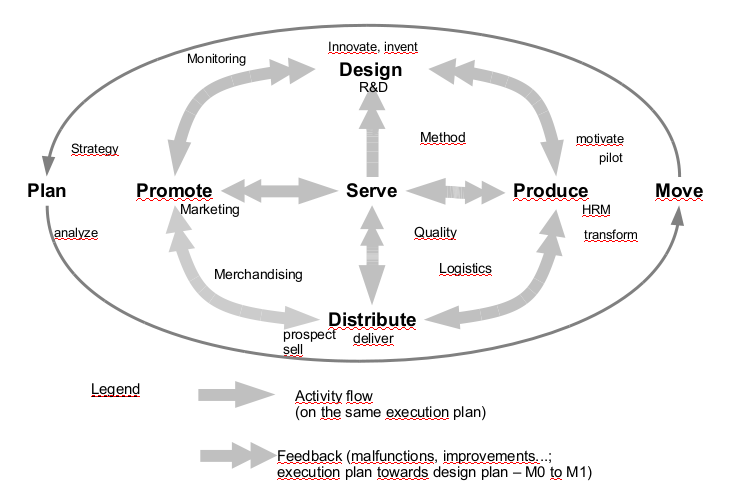 Generic model: “New value chain”.